Carl paints primarily from nature and from his travels throughout the U.S. and Europe as well as creating abstract nonrepresentational paintings. He paints mostly with watercolor and acrylic. Carl began painting as a child in Wisconsin, followed by a career as a consulting transportation engineer. Twenty one years ago he resumed his childhood dream of becoming an artist by studying at the Pacific Northwest College of Art continuing education program in Portland, Oregon, in the studio of James Kirk for over 15 years, and with Stephen Quiller. Carl has painted extensively in villages throughout France, including Monet’s Giverny garden, Spain and Portugal. Currently he is painting landscapes of the San Juan Islands and the Pacific Northwest as well as abstract nonrepresentational images. Carl attended the Pacific Northwest College of Art extension program in Portland, Oregon, later studied under James Kirk and Stephen Quiller, and has been painting for 25 years. He and his wife Penny moved to Orcas Island in 2005 and currently he is one of the managers of Artworks. When not in his studio they enjoy cruising the Salish Sea and Canadian waters and traveling the world. 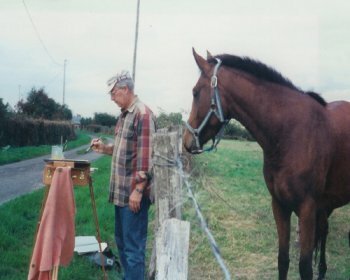 To view his paintings, visit www.carlbuttke.com. He lives on Orcas Island, Washington with his wife, Penny.